Thank you to Leslie Lippard who wrote this heartfelt testimonial about her experience at EBJI! The three things that I like most about EBJI are: 1) the teaching team, 2) the school community, and 3) the values that support both. The teaching team is awesome. Most schools would feel happy to have any one of our senior instructors. But we have a team of senior instructors that includes 6 people who are sandan (third degree black belt) or above. Every one of them is actively contributing to the judo community as an instructor, coach, a referee, in many cases at the elite level. Two of them are women. One is an Olympian. It’s impossible to come to class and not feel inspired, motivated to stretch yourself. When I first came to EBJI, I came from a women-only school. I’d taken 10 years off, so was very out of shape. I’m old (soon hitting the big 5-0). In spite of all that, in this “competitive” judo school, I have found a home. Working hard is respected, whether you are 5 years old or 55. We have lots of elite athletes around, but even though I am not and never will be ‘elite’, I get lots of coaching and attention. My judo has come a long way in the 3 years I’ve been training here. Working with the men in class is a challenge, but a rewarding one. Women are given the same opportunity and consideration as the men. 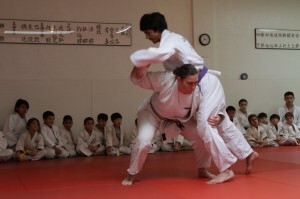 Working with the kids & teens helps my judo, but I also feel like I can help them grow as athletes. If I can inspire them to believe that judo can be something that is a lifelong passion, then I’ve paid forward what was given to me when I was younger. Finally, there are values at the heart of the school that I embrace. Sensei Matsumoto occasionally uses the phrase “building good people through judo”and I don’t think that he is just talking about training winning competitors. I think that he means something much richer, that incorporates living a life that values practice, perseverance, and passion. I look at his example, how he teaches, and the values that he has passed on to his kids and throughout the school, and these are principles that bring out the best in each of us.